Exerpt: From the Gold Cross Magazine CEU Article "Chronic Kidney Disease: A "Quiet Epidemic"
Download the entire article "Chronic Kidney Disease" a "Quiet Epidemic"
The renal system is the primary regulator of the body’s internal environment, and therefore essential for life. Without adequate renal function, the body cannot maintain a stable internal environment, and all of its systems are adversely affected. Although the human body can function well with only one kidney, most people have two. The kidneys are two bean-shaped organs, each about the size of a fist, located just below the posterior rib cage, one on each side of the spine. 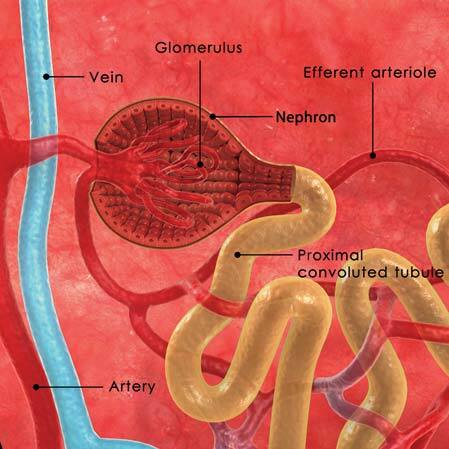 glomerulus, and a tubule. The glomerulus lets fluid and waste products pass through it, but prevents blood cells and large molecules, mostly proteins, from passing. The filtered fluid then passes through the tubule, which sends minerals back to the bloodstream and removes wastes. The nephrons filter about 200 quarts of fluid daily – enough to fill a large bathtub – reabsorbing all but approximately two liters of toxins, waste and excess fluid, which leave the body as urine. Urine flows from each kidney through a thin muscular tube called a ureter, and empties into the bladder. Through this filtering process, the kidneys help control blood pressure and make hormones the body needs to stay healthy, such as the one that stimulates bone marrow production of red blood cells. In addition, the kidneys help maintain a stable balance of body chemicals, such as sodium, potassium, calcium and acid content. The glomerular filtration rate (GFR) test is most often used to check how well the kidneys are functioning. It estimates how much blood passes through the glomeruli each minute. Physicians calculate it from the results of a blood creatinine test – which measures how well the kidneys filter creatinine, a chemical waste molecule – and factoring age, body size and gender. A low GFR signifies the kidneys are not working as well as they should. As kidney disease worsens, the GFR number decreases. – Kidney function is normal, but there is evidence of kidney disease, such as proteinuria, or an abnormal amount of protein in the urine, or hematuria, blood in the urine. Hematuria can be visible or microscopic. Patients are asymptomatic. – Mildly decreased kidney function is noted, with proteinuria or hematuria, for example. Patients are asymptomatic. Restless legs that cause sleep problems. • Vasodilation (widening of the blood vessels due to relaxation of their muscular walls) – sepsis, anaphylaxis, certain drugs.